Prepared using lite peaches and fat free milk. 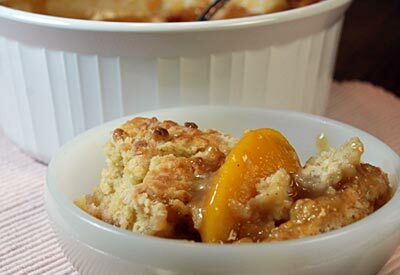 Place peaches in an ungreased 1- quart baking dish. In a small bowl, combine brown sugar, flour, salt and cinnamon. Stir in lemon juice and water. Pour over the peaches. Bake for 10 minutes or until hot. While the peaches are baking, prepare the topping. Combine flour, sugar, baking powder, salt and butter; cut with fork or pastry blender until crumbly. Stir in milk just until moistened. Drop by spoonfuls over hot peaches. *If using canned peaches, drain peaches and reserve the juice. Omit the 1/8 cup of water and use the reserved juice.